Matt777 wrote: The only thing that bugs me is that it looks like the 105 year old Eagle's Nest Cathedral would be demolished, and a parking structure put in its place. It's hard to tell but I don't see it in the renderings. There's got to be a way to preserve it. It doesn't take up much land and could become a great restaurant space or something creative. It would be a beautiful food hall. The preservation battle gained national attention because it pitted the public’s right to control zoning over a religious institution’s right to freely practice religion. 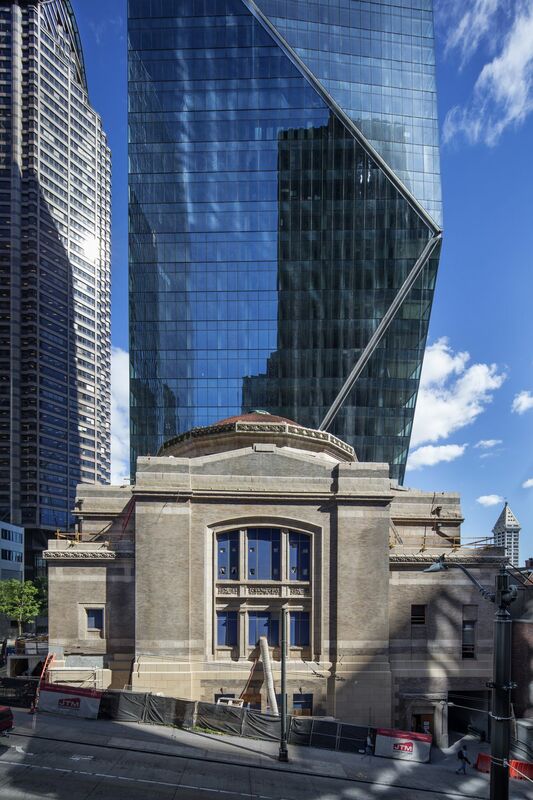 In a 5-4 vote the Washington state Supreme Court ruled in favor of the congregation and allowed for the demolition of the building without city landmark protection. After years of negotiation an agreement to save the building and construct a new facility for the congregation was reached in 2007. The original intention for the property by the congregation was to demolish the sanctuary building and build a 34 story high rise on the half block parcel. After purchase by Daniels the plans for the property now include the development of a new architecturally stunning high rise building that retains and compliments the historic sanctuary building. There are other examples too. In Dallas, any project on blocks in this area would be wise to incorporate the area's history. If I'm not mistaken, it looks like its still in the renderings posted. I don't think they own the land where that building is located. That last quote makes me less sure that this thing gets off the ground. I would love to see this happen just like I would love to have seen the Spire developement happen when it was announced but I am afraid this is looking like Spire. A big land grab but no tenants. Just like Spire, this swath of land represents as desirable redevelopment potential as any in Texas, it's just a matter of time, well, as long as the bottom doesn't fall out. For now, all I'm going to say anything about the name "Dallas Smart District" is that I'll say something about it later. I would look at entities with direct activities in Dallas AND Houston to fill up this side of town, because of the HSR of course. As HSR becomes more and more a reality rather than a good idea, I think we might even see a new streetcar route planned to loop through Smart District concurrent to the meet-up of OCTA and MATA. Any business or resident with daily or weekly activity in both cities will is a potential customer, and if there's an expansion, it'll likely happen in Dallas if the plan is cohesive and promoted. I would not want Amazon at this location, but the publicity coming from a bid is good. Smart District will compete with Matthews Southwest for office workers, residents and tourism associated with the trains between Dal-Hou. The thing that has really put a hold on building big projects like this, and skyscrapers in general, has been the damn banks. No one will lend money without a signed tenant anymore unlike before the recession where you could be allowed to make a business case for the market you were building in and why your development would attract tenants to get returns and profits. If that whole build it and they will come attitude was allowed to happen even just a little bit these days these projects would be far more likely to get off the ground. Because even without Amazon, there is demand. When asked about what 'Smart District' means on Fox 4 news this morning, the CEO said that they are designing and building for the next generation and not the last. He said the whole automobile mentality needs to change. They will be building based on ride sharing and autonomy. No more big hulking 'dinosaur parking garages' (his words, not mine). So... that was kinda good to hear... Also, he led on to believe that this development was targeting foreign clients... Oh, and it had a food hall component. Seems to be the theme of the week. How many halls can a city have?.. not enough apparently. Tivo_Kenevil wrote: How many halls can a city have?.. not enough apparently. Seriously. I just updated both the Sylvan Thirty and East Dallas threads, because two food halls were announced in both of those areas, on top of the one announced for West End and the current one in the Farmer's Market. The worst part is, all of these barely qualify as food halls. They all sounds so very small, to the point where it just seems pointless in my eyes. I was thinking the same thing... Legacy seems to have gotten it right. But, if we're loose with the definition, the KFC/Taco Bell combo down the street could classify as a 'Food Hall'. I wouldn't worry. The too small and insignificant food halls will quietly fade away. Uptown Market is struggling as well and it has a lot of things going for it. The food halls that actually have something worth visiting will retain customers while the trendy only places will get replaced with another trendy Dallas restaurant swiftly after they close. Keep in mind it's just another word for Food Court which Downtown office towers have plenty of already. BofA has one and so does Renaissance Tower and those work because they such a large captive audience who just wants a cheap sub sandwich. In the case of this development if they build half of the buildings not even including the tallest they will generate lots of lunch-goers looking for variety on a weekly basis so an internal food hall and one on the edge like the Farmers Market is totally doable. Not to mention the start of any construction of this development will generate additional development in close proximity generating more potential customers. I imagine that dress like structure pictured in the middle of most of the renderings is the food hall. I wondered what signature element that was for. They make sure you see it in almost every angle so it had to be for some featured element of the development besides a restaurant or office lobby. haha I was going to say it's just another word for cafeteria! Repackaging and recycling a proven concept is usually a safe bet, as long as the product answers to consumers seasonal/regular tweaks will keep it viable. I'm curious about The Dallas Smart District.... somewhere along the way, I think it was mentioned the development will rollout (hopefully) without overabundant parking and the same intense commuter-focused infrastructure that's been popular and municipally mandated since the 60s. But, so far, this first phase advertising, pre-pre-preleasing introduction to awareness raising efforts has not indicated how the 8 million sq ft of office space will interface with public transportation and trails. The Rail Station under the convention center really needs to be moved to the "backside," remaking the entire service entry into a mixed use concentration of specialness. cowboyeagle05 wrote: BofA has one and so does Renaissance Tower and those work because they such a large captive audience who just wants a cheap sub sandwich. I went walking through the tunnels a few weeks ago and the Renaissance Tower food court is still thriving. I still eat there sometimes. I had not been to the BOA food court in years, but walked over there and it's really sad. It's dark and depressing. The "Starbucks" has been replaced with some knockoff that sells starbucks coffee. And most of the places I remember are gone and at lunchtime, it really wasn't very busy. Renaissance Tower has kept it's food court, bright and clean. BOA, not so much. The entire lobby and lower level of BOA is in need of a major redo and the food court needs to shuttered. It's a very easy walk over to Renaissance Tower from there. I'm with you on everything but the Starbucks "knockoff." That place has better service, shorter lines, and better food than Starbucks. I work in Renaissance Tower and I will walk to BofA just to go to that place. Based on what Exxon built in the Woodlands and XTO exiting downtown Fort Worth to that campus, I would think it’s only a matter of time before Exxon’s corporate brass relocates to the Woodlands. This was published yesterday but is a locked article ... does anyone subscribe who can summarize what it says? Anything new being added that we don't already know? Dallas entrepreneur Mike Hoque plans to spend about 70 percent of his time focused on building a gateway to southern Dallas near city hall. Hoque chats about the project, how it came to be and what he's trying to create in the city center. tamtagon wrote: The Rail Station under the convention center really needs to be moved to the "backside," remaking the entire service entry into a mixed use concentration of specialness. "Besides the pipeline of projects, several proposed developments in DFW sit in limbo, searching for funding, anchor tenants, or absorption in similar product types. Most notably, Ross Perot Jr.’s Hillwood partnered with famed architect Sir Norman Foster to propose a 70-story skyscraper on the other side of Woodall Rodgers from the Perot Museum. Hillwood would need an anchor tenant to get the development off paper and in the ground. 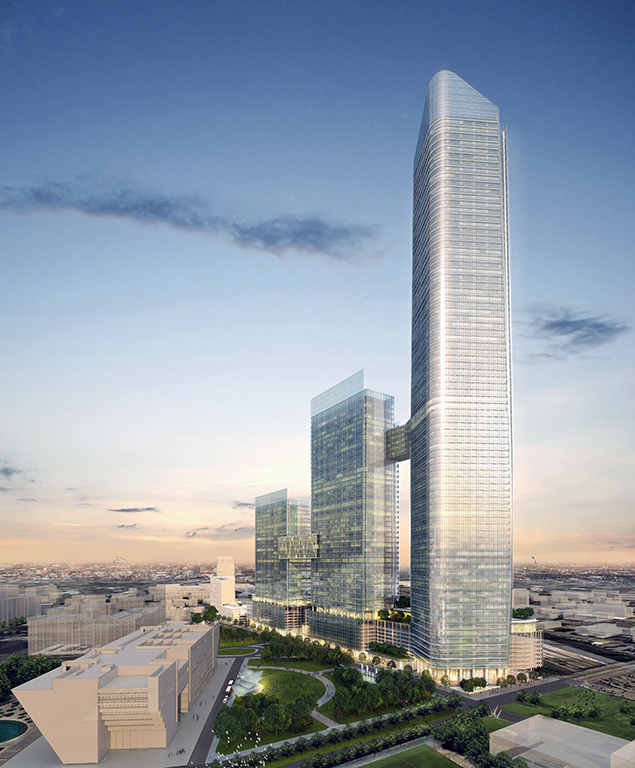 Hoque Global and KDC have proposed a 78-story tower. Hoque and KDC said they’d begin building a 20-acre mixed-use campus downtown, dubbed the Dallas Smart District, by the end of 2018." The fact that KDC is involved gives me hope that this will actually come to fruition. Interesting bits of information in this article — some of which conflict. On one hand, the article states that there’s an undisclosed 500,000 square foot tenant and phase 1 will break ground later this year. On the other hand, the article states that the Smart District is in a holding pattern until Amazon selects a location. You have to pay attention to the specific language used "The Smart District is in something of a partial holding pattern until Amazon decides where to locate its HQ2. " A "partial holding pattern" meaning we have plans to build without Amazon but if they say our name we will come running. That's, of course, is if he telling the truth about having the financing in place for this first phase. Not that I am calling him a liar but many developers have produced renderings over the years. Let's hope this one is the one that actually turns dirt. It's been about a year since this was announced...someone give Hoque a call and find out what's going on. Yeah, I was thinking the same when I drove down Canton St. last week. Still no sign of activity, in fact it looked like the parking lots are still operating. I don’t think they have even drilled for soil samples. The first phase is supposed to start this fall. Just doesn’t look like it. We just have to wait and see about Amazon. Remember last year when Hoque said an announcement would be coming soon regarding a “first of its kind major brand” moving to the district... By soon did he mean a few years? Yeah, he also said he wasn't dependent on Amazon to move this project forward. This is a massive project for Hoque and he signed up with KDC to get it built if all the pieces fell into place. Well hopefully this is not yet another Spire situation and nothing but smoke and mirror bull crap that Dallas attracts. But I do see the reasoning for waiting for Amazon to decide, the Smart District IMO is probably the leading Dallas site for Amazon should they choose Dallas even over the Victory Park location. The good news is that if Amazon either doesnt choose Dallas or decide to split HQ2 into two parts as rumored as a possibility, this is at least close to the High speed rail station that once that gets built will bring the area's value and development opportunities through the roof. I also wonder if that is another reason for waiting along with Amazon. And last but not least City Hall has been mulling putting a deck part over 30 near there, so should that happen something will go in here. The location and possibilities will probably help keep this thing from becoming another Spire fiasco. I know for Dallas and Atlanta, the HQ2 process has at least put the spotlight on near-ready downtown masterplans to land a one of the big corporate relocations or consolidations scouting around the country. The promise in Dallas is substantial with so much passenger rail expansion, D2 & HSR. 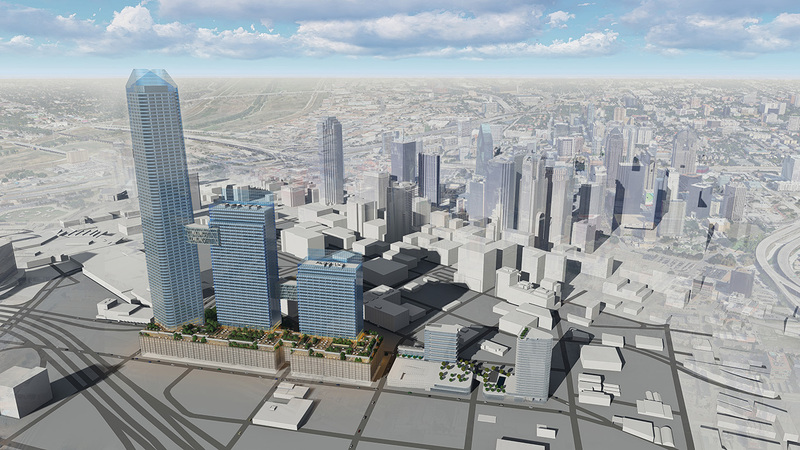 The next decade on the southern rim of downtown should see massive development one way or another. Adding renewed promise to the southern rim is the Trinity River Park. With the push for a highway finally fading away, the reality of what is actually sustainable and usable is rooting in the minds of decision makers on all sides of the conundrum. The benefit of a huge nature park is making sense more and more regardless of what eventually happens. UnderWater park is more likely based on this rain. tamtagon wrote: Adding renewed promise to the southern rim is the Trinity River Park. With the push for a highway finally fading away, the reality of what is actually sustainable and usable is rooting in the minds of decision makers on all sides of the conundrum. The benefit of a huge nature park is making sense more and more regardless of what eventually happens. The tragedy of the Trinity River Park is that 20 years have been wasted fighting over a highway plan that is about as backwards and archaic as it gets. I can't think of any other American city in that time frame debating whether or not to build a highway through their prime spots of nature! It would be like Pittsburgh wasting 20 years deciding on whether or not to bring back steel mills across the river from Downtown. I'm glad that the zombie tollway is finally dead, but there's still this tendency to base "quality of life" improvements solely around real estate and economic development potential. Economic development is a nice bonus, but why is it always the primary? So investments in greenspace are held up hostage until there's a proven economic benefit? Same thing is true for sidewalk improvements. It took AT&T's threats to leave Downtown for the city to finally do something. If they would have used that bond election 20 years ago to do nothing but create wet lands, curve the river if so desired, build some bike paths and set the entire thing with native grasses and wildflowers it would have been done 15 years ago and would be a well established natural attraction that by itself would attract a ton of visitors by now. Instead we have what we have which is an unending mess. Oh, and it also would have been much less expensive. Interview with Mike Hoque. Around the 12 minute mark the interviewer asks him about a timetable, and he says they're talking with a specific tenant and once they make a decision they'll break ground. So, nothing too new, but he's definitely committed. If not Amazon, who are the big fish that could be considering a corporate relocation right now, and would need a lot of consolidated office space for corporate staff? Maybe General Electric, FedEx, Wells Fargo, JP Morgan Chase, or a healthcare company? IBM tends to build large satellite campuses too. Exxon just built a massive worker bee complex in suburban Houston. Only the big wigs are based out of Irving. They could be a part of Smart District, but Hoque keeps referring to one specific client to anchor it. Could be Hot Air Inc., but maybe we'll be surprised. Hot Air inc. sounds about right. Recall, that they said they would break ground by year end (2018) ..Amazon or not. Well it's 2019 and there's no Amazon. Also no details moving. Dang! That tower completely dwarfs BOA and possibly anything on this side of the Mississippi. That looks like it could be 2000 feet tall! So, how many stories is the biggie? IINM, I counted 90 stories, just from first glance. Wow, this complex is going to need serious *serious* leasing and corporate relocations. *If* it isn't just a drawing of wishful thinking. Didn't even bother rendering its relationship to anything south of it. Dallas Mentality Monument we'll call it. If the tall-boy in the "smart district" development is going to be taller than downtown's BoA, it would have to surpass 921 feet. Well, if it's gotta be, then I set the minimum tallest in Dallas at 1,200. Very interesting....yet again...but will believe it when the cranes go up. Unfortunately, I have to agree with the lack of enthusiasm. With the current downtrend in the real estate market, I'm going to remain diligently dubious. My fingers are crossed. But I'm not holding my breath. A downtrend from smoking hot to glowing red is still a market full of enthusiasm.... Uptown is among the most expensive in South Central US, but compared to similar submarkets of pier cities across the country, Uptown is a bargain. At some point, the location will have to be accepted as one that commands a higher price because it's so nice. Cheaply built, I'm sure some is, even suspect some was built with the intention of lasting 20 years! I’m curious if Hoque is partnered with KDC going forward with these properties or if that was strictly for the Amazon HQ2 proposal. This thing is certainly a pipe dream as a spec project, but KDC has been involved in the majority of DFW’s large-scale developments over the past 5-10 years. If there is a developer that is capable of pulling off one big or several sizable relocations to make this a reality, there is probably no development company better, more capable than KDC.